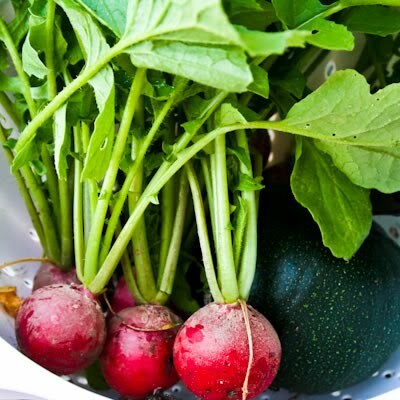 Even if you’re not a gardener, you can probably imagine how I was smiling as I picked my first garden produce of the year, radishes and one 8-Ball zucchini! 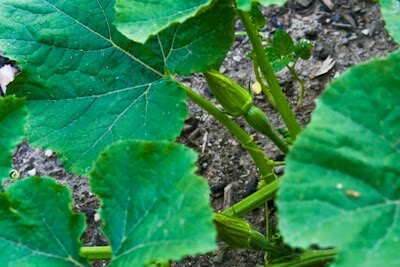 Keep reading to see what other veggies are showing up in the garden this week. 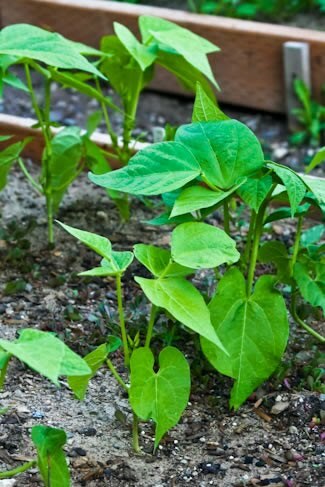 I haven’t spotted any baby green beans, but the beans are up and looking healthy. These are bush beans, which I find are much easier to keep picked. The kale is coming up pretty well. 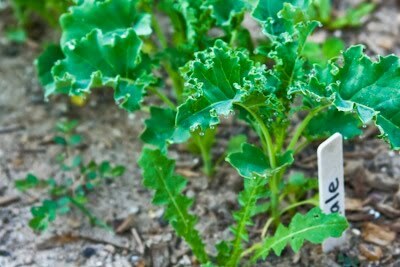 I love Red Russian Kale, but this year I planted Tuscan Kale, so I can make Roasted Kale Chips! The swiss chard is also looking healthy, and I’m going to trim some of the biggest leaves in about a week. My collards are also growing well, but something is nibbling on them, and I’m thinking I need to mix up some soapy water and give them a spray. Any other ideas that don’t involve pesticides? 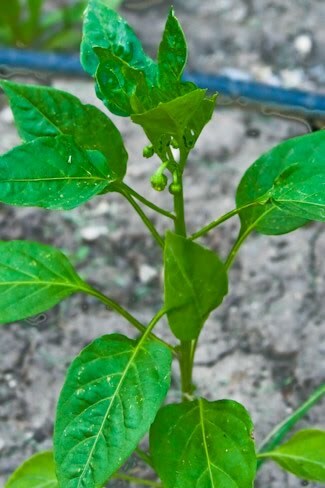 I haven’t had super good luck growing bell peppers, but this year I moved them next to my neighbors garage where there is a drip watering system, and the plants have quite a few baby peppers, so maybe they like it there! 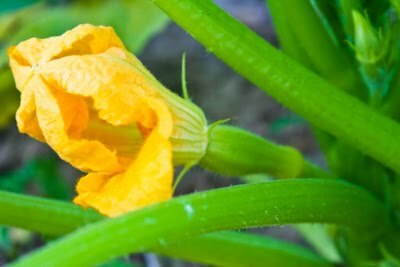 All my squash plants have lots of baby squashes. This is yellow straightneck squash, something I grow every year. 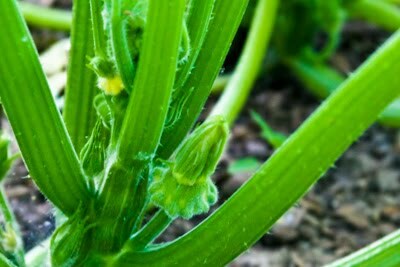 This is the Flying Saucer Squash which I’m growing for the first time this year. They look a lot like Pattypan Squash, so I’m curious to see if there is a difference. 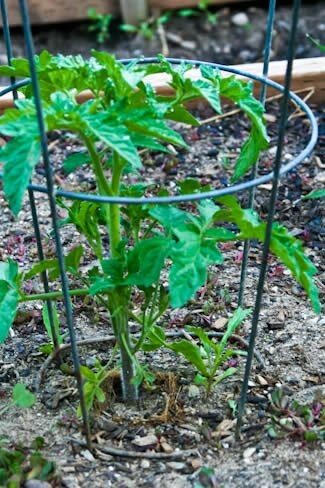 Just for Nate, here is how the heirloom tomatoes I planted from seeds are progressing. Nate sent me three kinds of heirloom seeds. It snowed on the tiny plants, but three tomatoes have survived and are doing well. 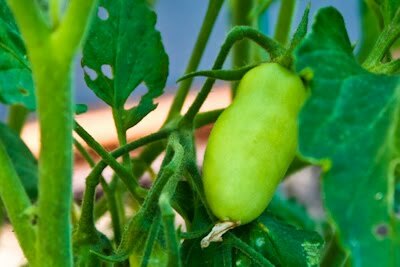 Finally, this is a super-closeup photo, but I also have some baby Roma Tomatoes on my plants, which means slow roasted tomatoes in my future! You can see my garden updates from other years in the sidebar of the blog, or use the label 2010 Garden Updates to see the other updates from this year. I am really excited to find a site with South Beach diet friendly recipes! I, too, have some baby Roma tomatoes going. So far, I've only harvested 3. 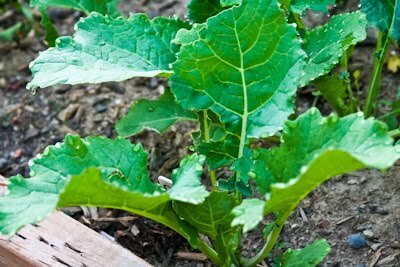 I noticed you have some leafy vegetables in your garden. I live in Austin, Texas and can only grow them in the winter here due to the heat. I love having fresh lettuce in the garden. Most of these comments were published from the iPhone, so sorry I haven't been responding! I'm really happy about how my garden is coming along after the rainy and snowy few weeks we had in Utah. Your garden's coming along well this year despite getting snowed on! I wish I could say the same for mine… the conditions started out perfect here and then got wacky! Today I will put some lime down to adjust the pH. I'm hoping that helps my plants to fill out. Your garden looks fabulous! Summer heat here in Arizona is starting to "slow roast" my tomatoes on the vine! Hehehehe… Seriously… everything looks fantastic in your garden! Can't' wait for an update! Lovely! 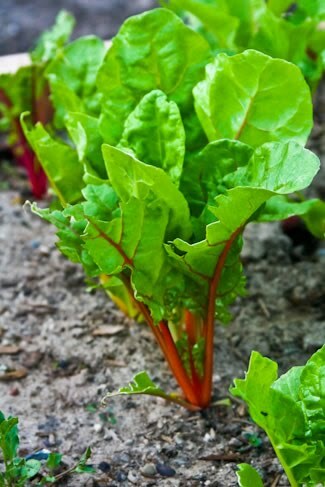 Our chard is almost ready for picking and I should be able to harvest some when I get back from F&L workshop next week. That's a beautiful garden you have there, Kalyn. I'm envious. Oh, to pick radishes right out of your own beds! Because of the late and hard rains we've had, I'm just now weeding and cleaning up the winter mess so I can begin planting. I do have tomatoes and peppers in the greenhouse. These photos make me miss gardening. It's so exciting to watch the fledgling plants grow strong and produce. Inspiring! It has been a scorcher here in E.Tennessee, if we don't get rain we will have to start watering the garden ourselves. And, it's a big garden! Isn't having a veggie garden wonderful? I too love being able to pick my own veggie and eat them practically off the vine. I've got over 20 Heirloom tomatoes in our garden and I can't wait to sink my teeth into them. A tomato sandwich, YUM! These photos are great!! I can only imagine how fun it will be when you have lots of veggies and can use them in your fabulous recipes! Your garden is really blossoming. Those radishes look fantastic and I am so envious of that Swiss chard. I promise myself to plant some next year. I am so excited for your garden! There's nothing like homegrown squash and tomatoes, the flavors are so much more superior. What makes me most envious is that you don't have deer eating everything in your garden! Your veggies look beautiful. 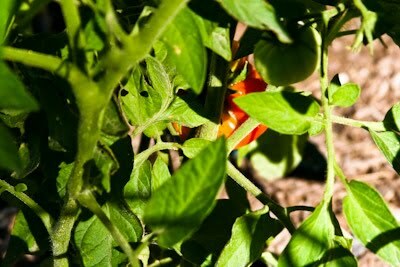 There's nothing like the sight of the season's first tomato, even if it's in someone else's garden. I love picking vegetables! Nice presentation of your picking veggies, can't wait to see others when they're ready to pick!